I last wrote about using Angelonia in the meditation circle and it was still on my mind when I began planning a vase for this week. The rich colors seemed to be a good starting point for an arrangement. As an afterthought I also brought in some gladiolas from a bulb collection planted this spring, misleadingly named Gladiolus ‘Blue Shades Mix.’ Do pink and magenta really qualify as blue shades? No, but these flowers are lovely. This is the first purple from this “blue collection.” I like it a lot. 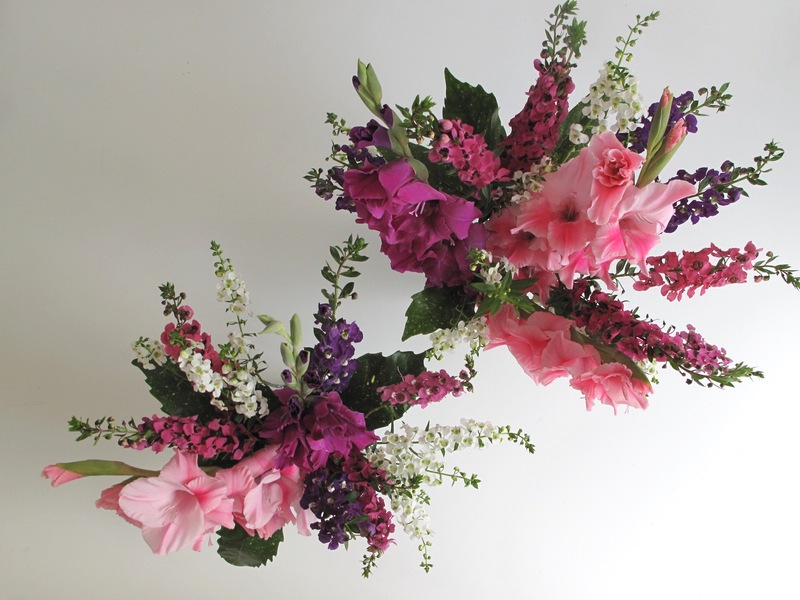 Somehow Gladiolus became the focal flower for today, with the Angelonia taking on a supporting role. In spring I planted a small Aucuba japonica ‘Variegata’ (Gold Dust Aucuba) for the express purpose of exploiting its foliage for flower design. That shrub is doing well enough to contribute a few dark, shiny leaves today. A pair of glass vases that belonged to my maternal grandmother were the appropriate size. I inserted a rolled Aucuba leaf into each vase to hide the flower stems. Still searching for blue, here is a look from up above. This entry was posted in garden and tagged angelonia angustifolia, Aucuba japonica 'Variegata' (Gold Dust Aucuba), flower arranging, flower design, gladiolus, in a vase on monday, nature photography on July 27, 2015 by pbmgarden. I am so enjoying these posts and your lovely photographs. I’m glad Ann. You must be traveling this summer or deep into some big projects. Hope you’re having a nice summer. Better and better, Susie, I love your vases for this week. A shame that the bulbs weren’t the colour you expected but at least they are beautiful and look great together. Clever idea to use the leaf to hide the stems. Thank you Christina. I think I’m going to enjoy using the aucuba leaves, but the shrub is too young to use it much yet. Flower labels are getting harder and harder to trust, but you’re right–at least they do coordinate. Thanks Bev, these individual flowers are all attention-getters in their own right. Thanks. It’s wonderful to have fresh flowers in the house. Wow. YOur vase this week is fantastic. What beautiful colors. Thanks John. These colors shout a bit don’t they? Summer is a good time for exuberance though. Your vases are really pretty, and so interesting to see a completely new flower to me: the Angelonia. Thanks Noelle. I really like using Angelonia–very reliable. Oh what gorgeous glads Susie. I must remember to plant some at the allotment next year. Such great flowers for cutting. I’ve not heard of angelonias so thanks for the introduction. Thank Anna. I planted 40 new ones this year but don’t think they all made it. I’ll try again next year for more purples and blues. Angelonia does very well here–lasts until first frost in October. Orange glads sound wonderful actually. Too bad that didn’t work out. I placed the vases on either end of our dining room buffet, but the light was too poor to photograph them there. Your vase is elegant. Love the hydrangea and snapdragon combination. Your vases are so lovely, I like the color combinations and echoes. 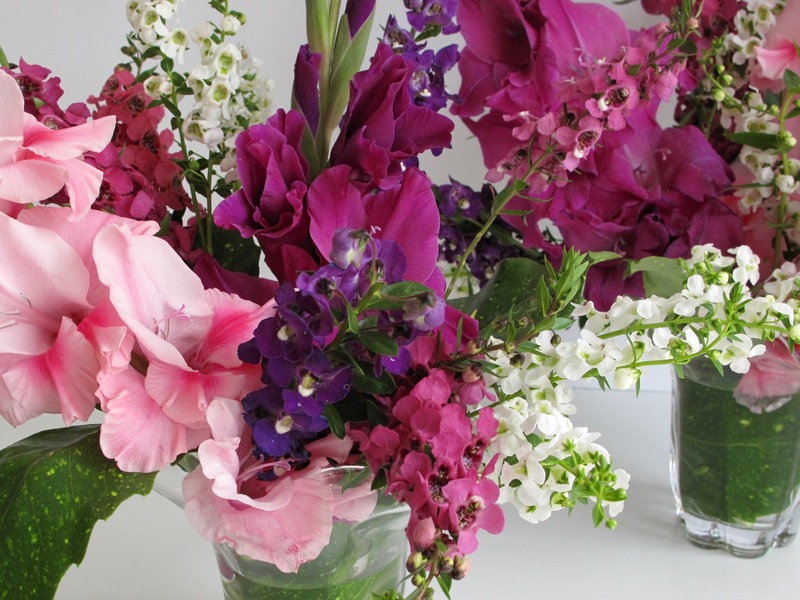 Glads are such sumptuous flowers in an arrangement, and the Angelonia complements it so well. 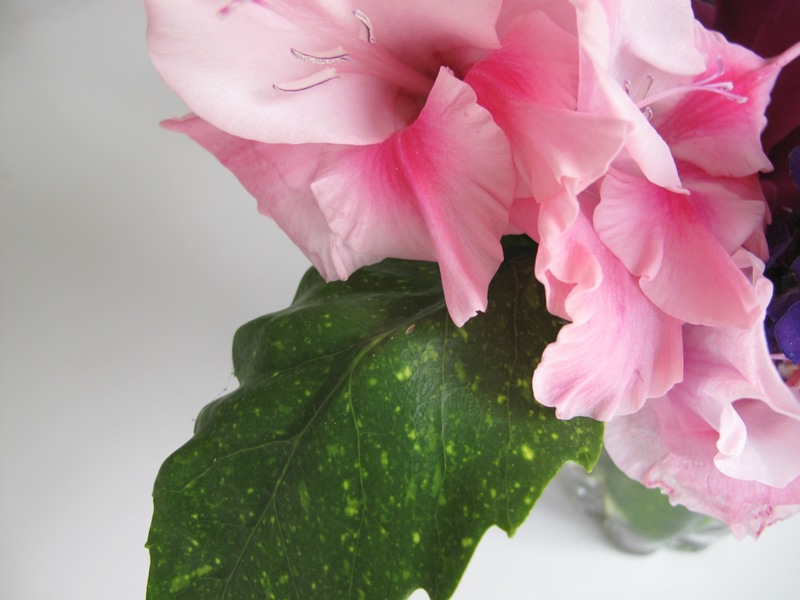 That’s a good idea, using the Aucuba leaves in the vase too to hide the stems. I am amused / peeved by the nursery industry’s vain attempts to create blues where there are none. They should stick to blue flowers like Delphiniums for their blue lust. And they don’t seem to like the name Magenta either, even though it is an extremely common flower color, and pretty too. So funny. Thanks Hannah. 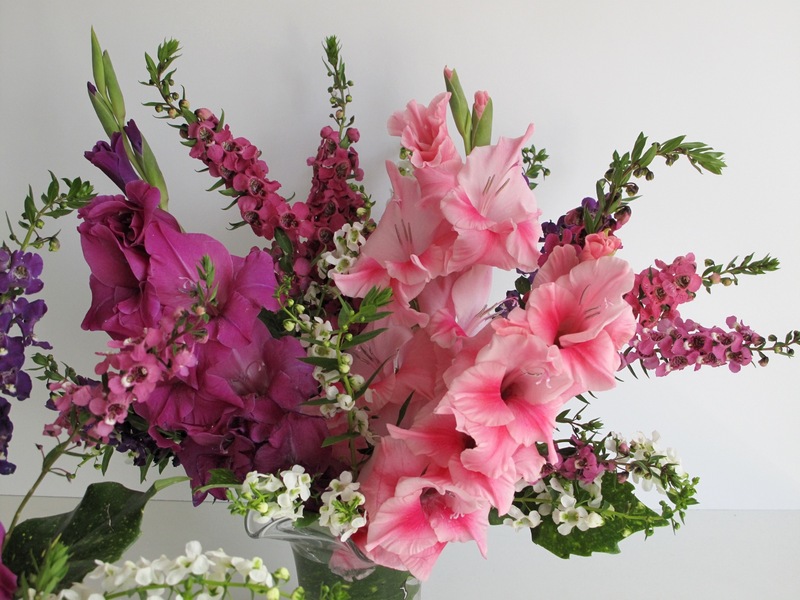 Fortunately gladioli are pretty in just about every color, so even a mix-up can be beautiful. You’re right, I rarely see Magenta on any label. The magic of flowers. Those gardening connections are pretty powerful aren’t they! 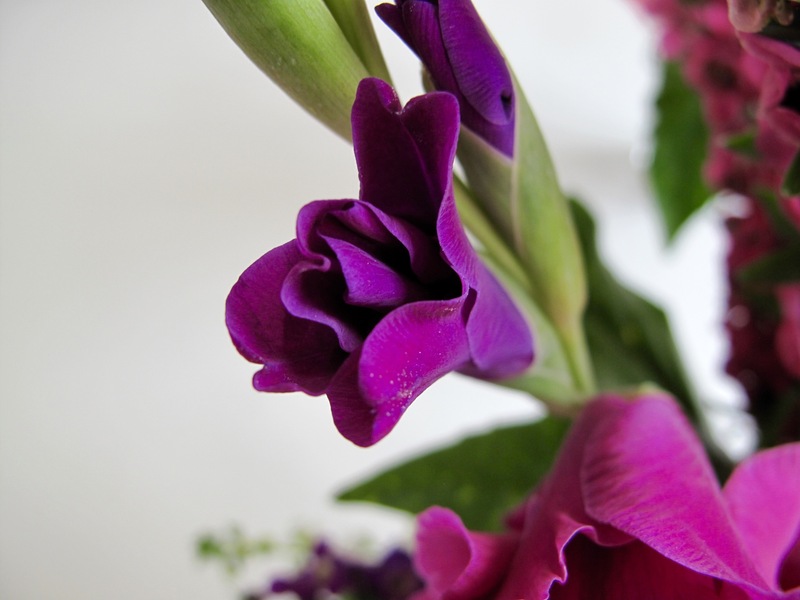 The glads are gorgeous, Susie, even if they were falsely advertised. I haven’t grown any in a long, long time but your post has me re-thinking that omission. 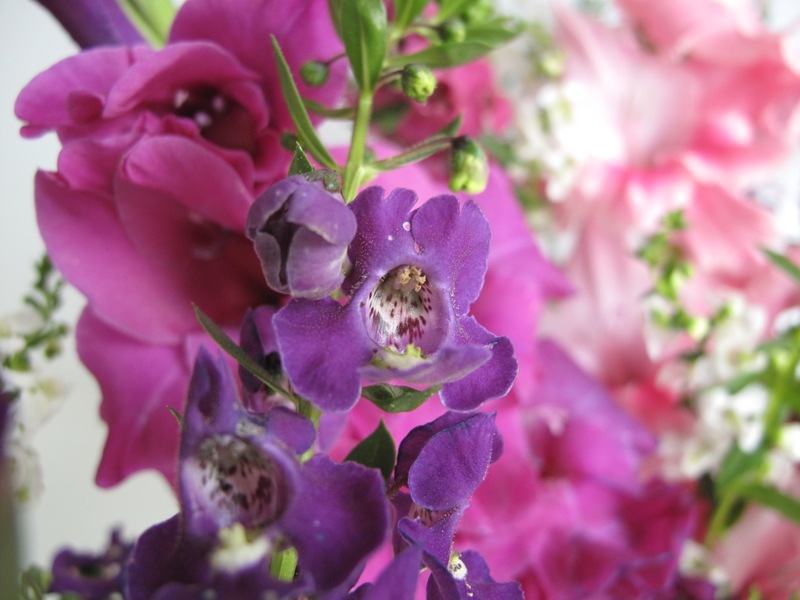 The Angelonia provides just the right accent. Thanks Kris. 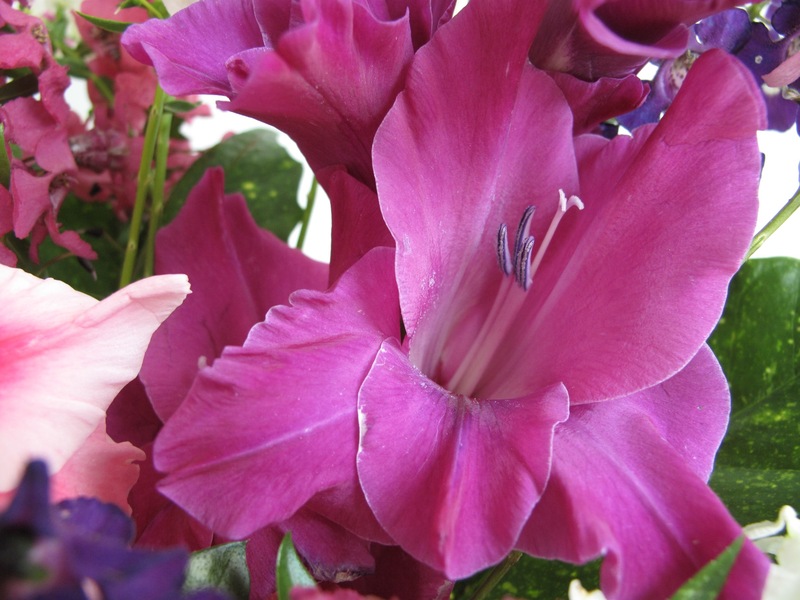 I know gladioli are often out of favor as too old-fashioned. Every year I enjoy them though so this year I added extra and I’m already planning to add more next spring. 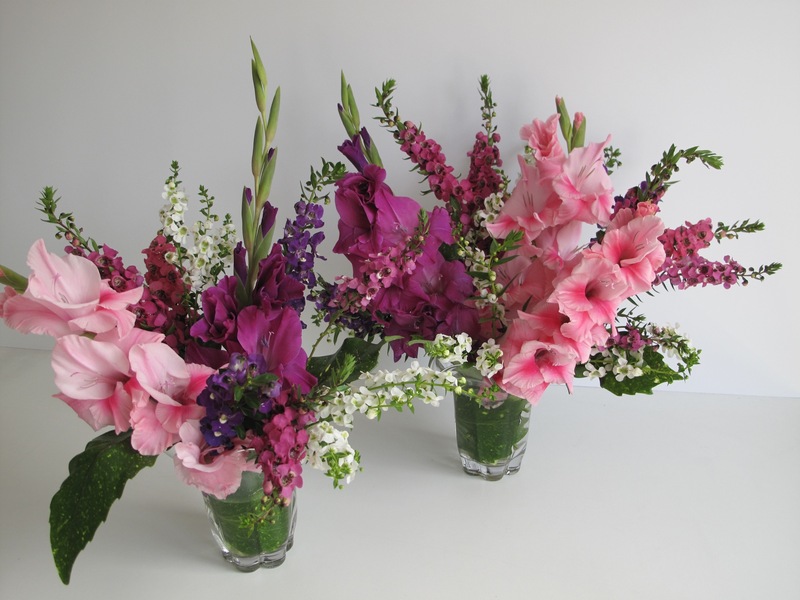 Once again stunning Susie…I loved the idea of the rolled leaf to hide the stems….and those glads are beautiful even if they are not blue….a perfect complement with the Angelonia. I had a sunflower mix this year that is supposed to be red varieties and all are just yellow…interesting how this happens. I did have some dark purple (almost blue) glads at one time that I loved and I really thought I’d found some again. The sunflowers mix I’m sure are lovely even if all yellow, but I understand how you feel. Yes, beautiful composition and beautiful photos and what a clever idea to use a leaf to hide untidy stems in a glass vase. Thanks so much. Using foliage that way streamlines the arrangement I think when the stems might be distracting. Beautiful colours and great combination of flowers, Susie! I appreciate that Anca! Thanks. Every time I see your Angelonias I think that I must track some down. Lovely combinations and colours. Angelonias do have a nice range of colors. Hope you can track some down. 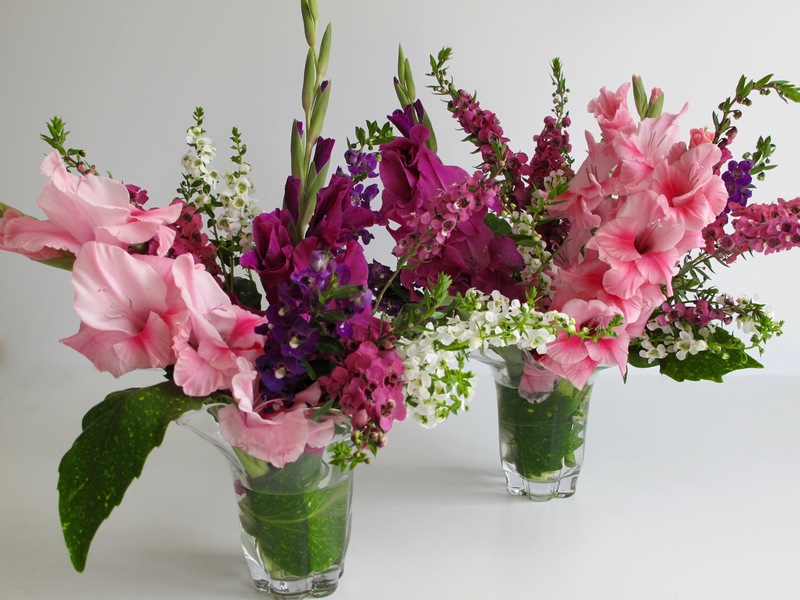 Wow, those look like professional arrangements–truly! I’ve been using Angelonia in my arrangements for church. It looks great with the Glads. I was planning to plant Glad bulbs this spring/summer, but never got around to it. Now it’s too late. Oh well. They’re so fabulous for cut flowers! Great arrangements! So kind of you Beth. 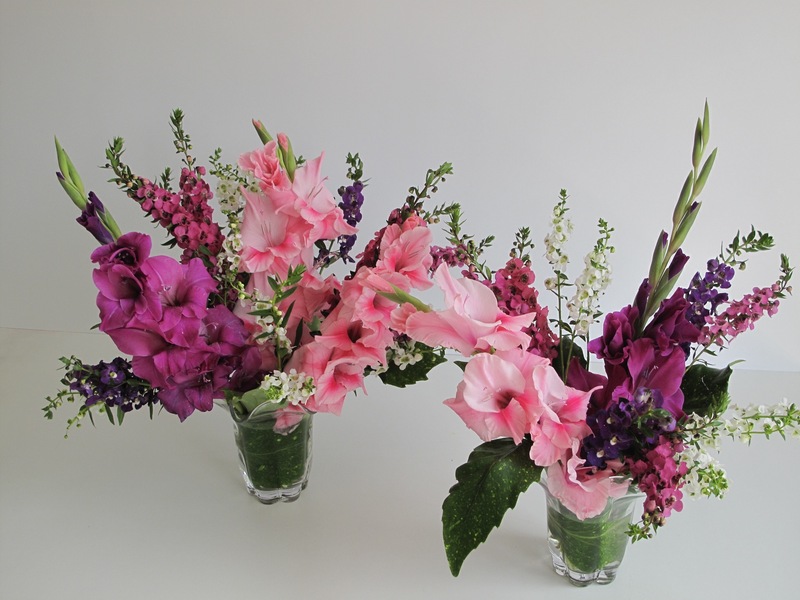 The gladiolas and angelonia are so vibrant they don’t need much arranging. Interesting that you’ve used angelonia for arrangements also. Many people seem unfamiliar with it but I first tried it in 2011. I’m starting to see many more commercial areas using it for their landscaping. Beautiful vases that would brighten up your home. Thank you, feels like a celebration! In spring I hadn’t planned the gladioli to be so matchy-matchy with the angelonia, but when the glads didn’t turn out blue, at least they coordinated well. What a wonderful colour scheme, I love it. I don’ t know Angelonias either, I must try and track it down. Thanks. The colors are nice and rich together. I don’t think Angelonia has long been available as seed, but I’m starting to see it this year. 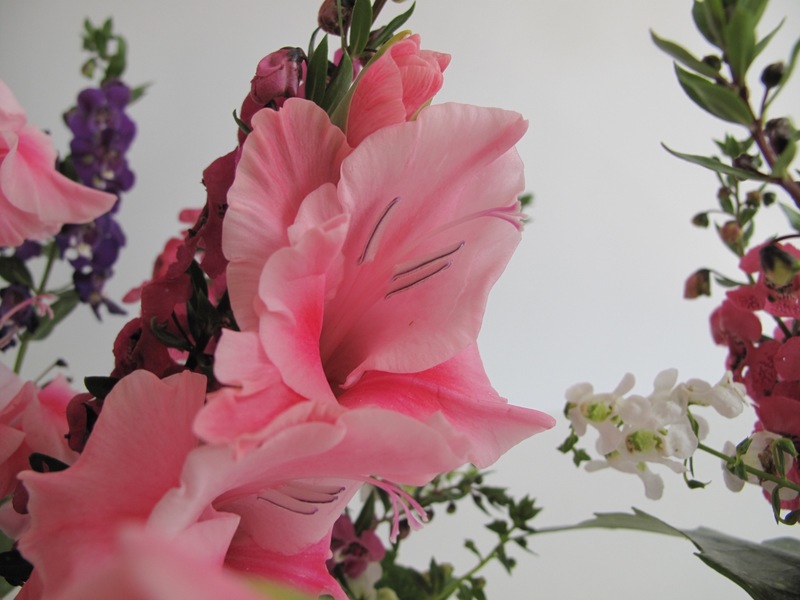 Pink Gladiolus is really lovely. I love the second photo from the last. Thank you. I had fun photographing these flowers–they were so riotously colorful.